We are disappointed and puzzled by Justice John Tsoho's incompetence to the rule of law and lack of infallibility to the judiciary due to his controllable love for money and not to disobey his grand masters (APC RASCALS) and also willing to be a tool for justifying injustice just to please and keep president Muhammadu Buhari happy. When did the Nigerian judiciary system turn to a market place and business association, where one can go and buy justice at any given time? Justice John Tsoho have forgotten that judges are supposed to make decisions based on the law, not politics. This will ultimately undermine the whole idea of an independent judiciary, which is the single most significant bedrock of a functioning democratic political system. This have proven that Justice John Tsoho is not capable and don't have the qualifying Characteristics of a competent judge. Justice Tsoho is working for the abusers of law and killers of Justice, which is Muhammadu Buhari. A president who have enforced his tyranny and dictatorship into corners of the Nigeria federation. He has now turned a democratic country into a dictatorship. Law and Justice means power and is built on values. For a successful revolution it is not enough that there is discontent. What is required is a profound and thorough conviction of the justice, necessity and importance of political and social rights. If you let corruption take over you and play a bit part in your court ruling, you are corrupt as well. A court with professionals and competent judges only conceals the fact that a verdict is a functionally defined expression of a repressive political mechanism. In the other hand, where courts and judges were used as a political weapon by the government of a state or country is explained as corruption in the judiciary system and should be dealt with by removing the image of the said corrupt judge from the judicial body because when court rulings are based upon what is suspected to be purely political, judges and judicial activism is used. Basically, the role Justice John Tsoho is playing, as regards to Nnamdi Kanu's case proves that he is nothing but a willing tool that is controlled by the President Muhammadu Buhari, so as to justify in favour of the Nigerian government. 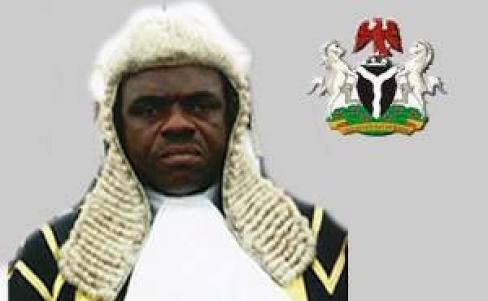 Justice John Tsoho is appointed by the federal government to help them in fighting political oppositions. In my opinion, the attorneys, judges, and guardians involved in this racket are really just a bunch of judicial killers, protected under the guise of political masters, when you think of a “corrupt” judge, you may think of one who trades rulings for cash. As far as we know, that obvious sort of corruption is rare. You must know however, that corruption may take subtle but equally destructive forms. Yes, this corrupt judges just invent the law as we go along, make up the law out of thin air, make up tradition and history out of thin air and make up whatever they need to make up, in order to deny Nnamdi Kanu a fair hearing. Justice John Tsoho is working in line with the DSS to clamp down on judges that is against the present sitting party oppositions by indirectly fighting them all in the name of fighting corruption. We therefore call on the world judicial bodies to act by dismissing the indicated corrupt judges because corruption in the judiciary is an insolent to the world judicial system. Also Nigeria Judicial system can not be trusted to work accordingly as long as president Buhari keeps breathing down their throats and keep harassing, threatening and arresting Judges who doesn't comply with his enforced dictatorial government. President Buhari must stand down in other for the judicial process to take effect.